Today, at least for part of the class, I was in familiar territory. Each student made a batch or two of jam and canned it. I made kiwi jam and chocolate banana spread; we also had raspberry, blackberry, quince, pear-ginger, apple-orange-rhubarb, and sour cherry jams, apricot glaze and caramel sauce. We did not use a boiling water bath, which is fine considering they are for personal consumption only and we were really just focusing on the experience of making jams with and without added pectin. The unfamiliar part for me was making jellies. 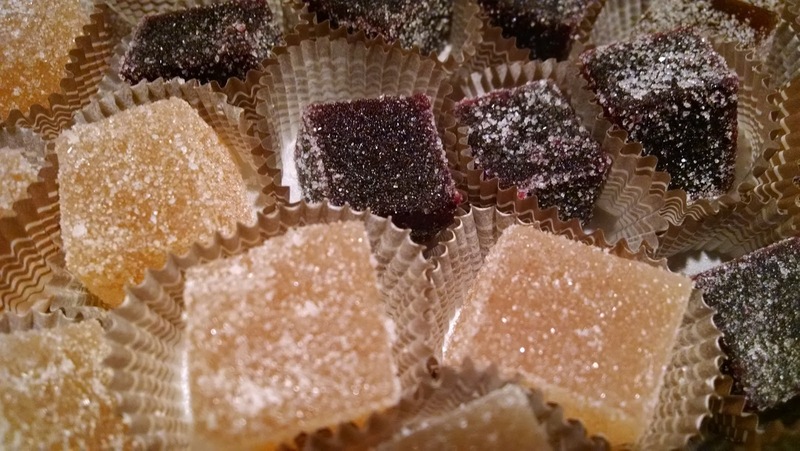 These are super-jellified sweets, coated in granulated sugar. They are very much like Turkish Delight except those are generally coated in confectioners' sugar. I made lychee flavored ones. I've never cooked with lychee. As far as I can recall, I don't think I've ever tasted a lychee before. They are somewhat intimidating. However, if you get the purée, they're not intimidating at all. They look just like any other fruit purée at that point. And they are crazy sweet, in a floral kind of way. Not as overwhelmingly floral as, say, biting on a cardamom pod (I know this from personal experience, it was 30 years ago and I still haven't forgotten) but still very fragrant. Each student made a batch of jellies: strawberry, mango, passion fruit, mixed dark berries, apricot, pear and lychee. Half went to us and half are being saved for an event in March. The recipes requires a lot of pectin but also inverted sugar, citric acid, fruit purée, and lots of regular sugar.